A resource for calculators, simulators, charts, formulas, and secrets. Conquer the Galaxy, One Planet at a Time. In the near distant future, space exploration has evolved into a much more sophisticated nature as planets are colonized by humans in a fierce battle for resources and influence. Immerse yourself in intergalactic diplomacy as you manage your bases and natural resources while waging war against enemies. Note: This post was made for Galaxy Empire version 1.6. The information here is out of date. I do not plan on updating it. Thanks for your interest. 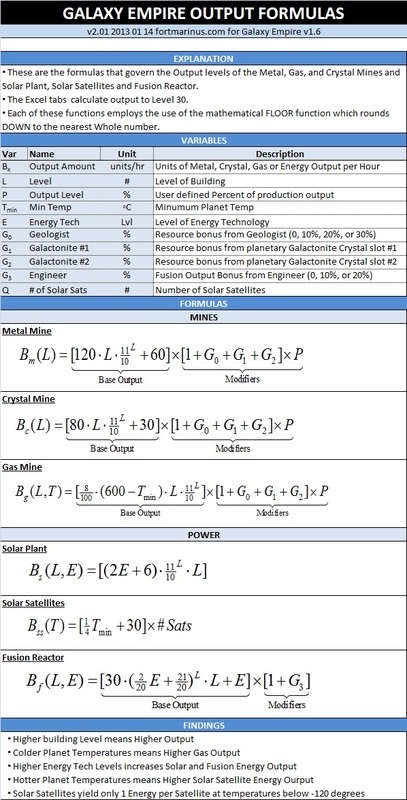 Fort Marinus has discovered the secret Galaxy Empire Output formulas for the Metal Mine, Crystal Mine, Gas Mine, Solar Plant, Solar Satellites, and the Fusion Reactor. With these formulas and associated tables, one can know the units of Gas, Metal, Crystal, and Energy produced per hour. This tool allows you to calculate the amount of time it will take to gather a certain amount of resources. It will also show how many resources you will have gathered after a certain amount of time. This tool allows you to simulate the combat of Galaxy Empires. Input the number of each type of ship for each combatant and see who wins. Note: This calculator is in beta form, the formulas are not exactly correct, but they are close. This Excel spreadsheet shows the costs for buildings and upgrades up to Level 30. It also explains the cost formula below in more detail. 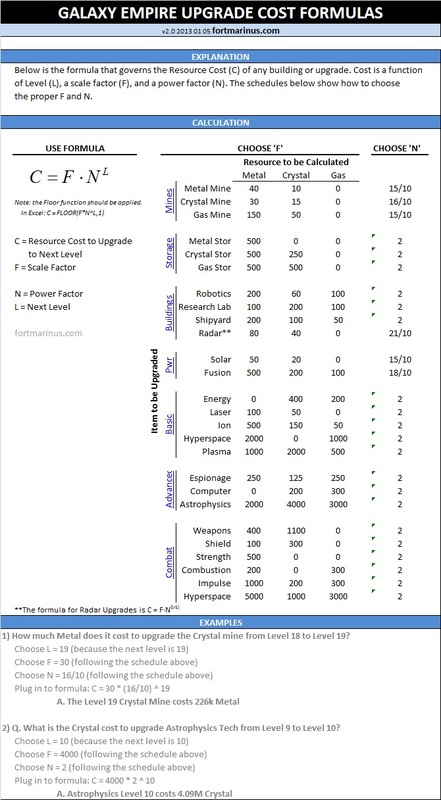 Use this formula and schedule to calculate the cost of any building/technology upgrade. - It is most efficient to send as few ships as possible. - Sending more than 300-400 ships results in a net Loss of resources. - What is the formula for the minimum loot curve? - What is the ‘chance’ formula to gain minimum or maximum loot, or somewhere in-between? These data were collected by attacking the Level 2 or Level 3 ‘The Purged’ planet with varying numbers of Light Fighters. No ships were lost in the attacks. 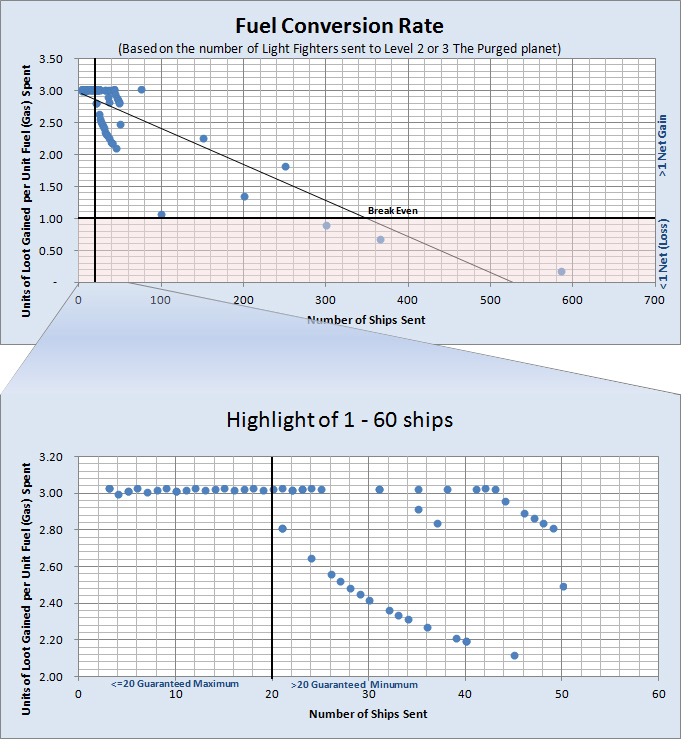 Initial observations of repeating this experiment with Destroyers attacking the Level 11 ‘Pollution Origins’ planet show that sending 50 or less ships is highly likely to yield a maximum loot gain of 1.21 units of Metal plus 1.21 units of Crystal for every unit of Fuel (gas) spent. Sending more than ~250 ships results in a net Loss of resources. Nice work – haven’t tried yet, but it seems like your calculator misses the defense-part. Like missiles, small lasers, plasma dome etc. Could you include those factors too in the next version? Keep up the good work, and may the Battleships and Nebulas be with you ! I WAS THINKING THAT WHEN YOU LOOSE SHIPS FIRST YOU LOOSE LF THEN HF AND SO ON AND YOUR CALCULATOR DOING IT DIFRENTLY sory for my english. Hi Fort, any chance in releasing your forumal for the ombat sim, so others might be able to expand on the fine start you have done?? I think the fusion reactor formula is wrong. I tried to compute it (with E=14, L=15) but the result didn’t match to the values of the game. Can you add an interceptor to your awesome Battle Calculator? I’m looking at your battle calculator formulas, and are you sure they’re accurate? I was under the impression (same as the commenter above in caps lock) that all enemy fire would first go to your light fighters, than heavy fighters, then cruisers, etc. all the way up the line. I wish i could know if you have na updated version of you battle simulator spreadsheet. If so, i am really interested in having it. Could you please forward to my email albert.sampaio@hotmail.com? Thanks a lot. referring to the battle calculator.